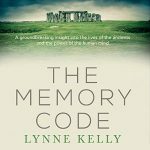 I was a guest at the inaugural Sunshine Coast International Readers and Writers Festival to talk about The Memory Code. I had no idea it would prove to be such an emotional time. 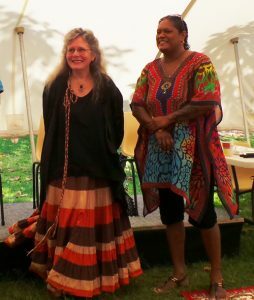 The affirmation of my work by the Traditional Owners proved to be far more powerful than I could have expected. We were welcomed to Gubbi Gubbi Country by Lyndon Davis and the Gubbi Gubbi Dancers. Festivals don’t start any better than this. My time with Traditional Owner, Bridgette Chilly Davis (Dhdugga Kabi Kabi), was an emotional one for both of us and for the audience. Bridgette talked about the songlines from the perspective of a Traditional Owner, what it was like to walk Country, to be in Country and to interact with the animals and plants in Country. She talked about the knowledge of the Old Ones and how it came to her so strongly when alone with them in the bush. She talked about the spiritual link, something I would not even pretend to be able to emulate. 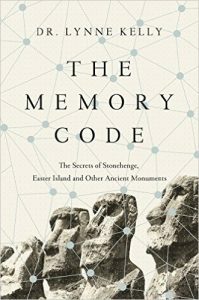 I talked about the way that the songs, dances, stories and links to sacred places in Country act as an extraordinary memory aid to all the complex knowledge of the culture: animals, plants, genealogies, navigation, geology, seasonality and something I think I have greatly underestimated – the way it all links together. No animal is known without understanding its relationship to all the other animals and plants which inhabit that ecological niche and the seasonal cycle. We answered a lot of questions from the audience, but throughout it was the connection to Bridgette and the Kabi Kabi knowledge which at times overpowered me. This is not the usual sensation of a science writer talking about a science book! The most moving moment for me was when Bridgette told the audience “She really gets it! She really gets it!”. 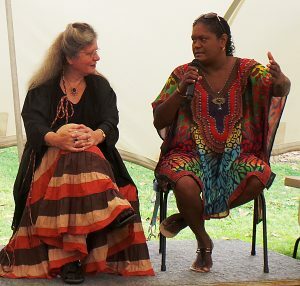 Members of the audience afterwards said they had listened to the Aboriginal stories and talk about Country many times but realised that they had not really understood that the connectives to Country was far more than just loving where they lived. My work acts as a segue to hearing what Bridgette was actually saying. How rewarding is that? Lyndon Davis ran a session on Dreamtime story-telling talking about the Gubbi Gubbi stories and songs, all of them about Country, animals, plants, seasons and responsibilities for Country. One story tells of the way the pilot fish of the mullet leads the migration and must never be killed. The largest fish are left and the Maroochy River ran think with mullet. Of course, these laws are not respected by fishermen today and there are few mullet left. The timing of the fishing was linked to the behaviour of the sea eagles. 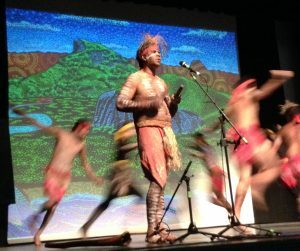 The stories Lyndon told and performed all reflected the integrated pragmatic knowledge of our Aboriginal cultures. A second session with Lyndon was about the language and the way words reflect the behaviour of the animals, nature of the plants, calls of the birds and so on. And all is linked to place, song, story and mythology. 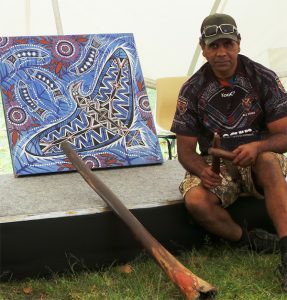 Lyndon’s paintings also reflect the Gubbi Gubbi stories, in particular his use of the sea eagle and details in the designs. 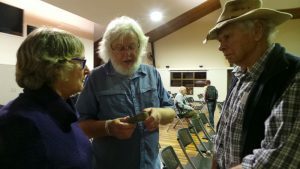 My husband, Damian, is an archaeologist, and spent time examining an axe head with archaeologist Helen Coooke and Uncle Herb Wharton (for non-Australian, Uncle is a term of respect for Aboriginal Elders). Thank you to the organisers for the invitation, in particular to Wendy O’Hanlon and Eileen Walder. 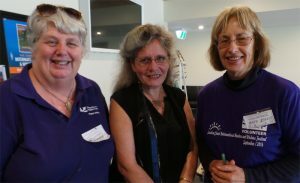 Thank you also to the volunteers, especially Linda Morse and Kate Eagles. This entry was posted in Australian Aboriginal, Gubbi Gubbi, indigenous memory systems, Kubi Kubi, memory, memory devices, primary orality, songlines, The Memory Code, Uncategorized and tagged art of memory, Australian Aboriginal, indigenous, Memory Spaces, primary orality, The Memory Code. Bookmark the permalink. Thank you Lynne – I discovered your book today, listening to Conversations with Richard Fidler and listened twice with immense joy and gratitude. While I deeply treasure Indigenous culture, I am not (sadly, I often feel) aboriginal myself and have deeply longed to understand more for years. Thank you so much, Toni. Your comment is hugely appreciated. I do hope that you enjoy the book and gain even more appreciation of the intellectual achievements of Aboriginal people. Just so wonderful to read your response to this segment of our inaugural Festival Lynne. Even as a non-aboriginal, (being a 10 pound Pom some 50 years ago), I can truly feel a spiritual connection to this region and now my world travels led me to settle here so I cannot imagine how powerful the sense of belonging must be for those whose ancestors walked this country. 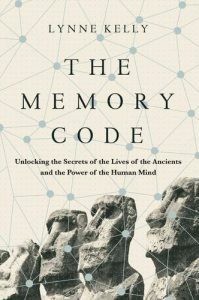 I have yet to read The Memory Code but it is at the very top of my bucket list now I have a few weeks to recover from such an incredible event which went far beyond our dreams when Wendy first broached the possibility with me. Thank you, Eileen. I had a wonderful time. Congratulations again on the success of the Festival. Lynne, what a wonderful compliment from Bridgette and so well deserved you obviously ‘do get it’.